There was a time when a trip to St.Denis and the Stade de France would have struck fear into the most hardened of Irish Rugby Internationals. The sights , smells , sounds are all so different to a regular International venue that very quickly a player can find themselves lost in a sea of unfamiliarity and soon lose focus on the job at hand, winning in Paris. The trip to the ground alone is enough to fill your brain for the next four hours if you allowed it to do so. The sight of French motorcycle police literally kicking cars to get out of the way as they hurtled along at over 100 kmh is something to behold as you sit on the team bus buzzing with the excitement of it all. I can honestly remember older players saying to me on my first trip to Paris, “wait til you see the trip to the stadium the cops on the bikes are lunatics” and they didn’t disappoint. So what about this weekend will the new crop of Irish players be distracted by the blue flashing lights? I seriously doubt it. Last week I was extremely nervous before the Wales game. We had seen some quality and heroic performances from the Welsh during the World Cup and most people felt we were in for a bit of a hiding. Happily that was not the case and overall it was a pretty decent although far from perfect performance. The French have to be one of the most difficult teams in the world to work out, you can never tell what you are going to get. Guy Noves has made six changes to a team that won last week and we still don’t know what they will bring to the table. Ireland on the other hand seem to have a more familiar look to them this week. Sean O’Brien is back to complete a fairly formidable looking backrow with Heaslip and Stander. Rob Kearney returns along with his brother and everywhere else remains the same. My biggest fear about this game still remains with the front row, the French are huge and our performance in the scrum last week was poor. If we don’t sort that area out it’s going to be a long day. I feel good about this one. 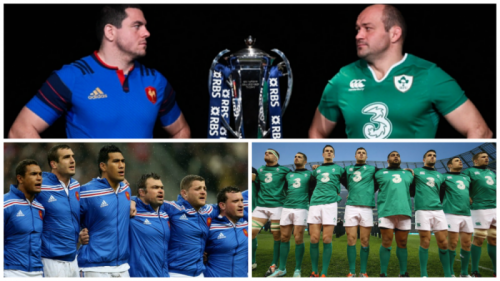 We have not had too much success over the years in France but given the French are in transition and Ireland gave me some hope last week against a tough Welsh outfit, I’m going for a narrow Irish win.